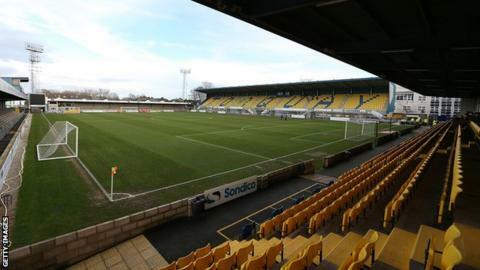 Torquay United are in talks about moving to a new stadium on the outskirts of the town. The club have been at their current Plainmoor home, which is owned by Torbay Council, for 105 years, but have been approached by an American firm about building a new ground. Under the deal, the developers would pay for the stadium in exchange for council land to build housing on. The new ground would have a synthetic 4G pitch and a capacity of 6,000. "The developers have met the council, it's at an early stage and it depends on what land can be built on," Torquay chairman David Phillips told BBC Sport. "The land for housing would be wherever is available, the council have to build 10,000 houses in the next 20 years." Torquay opened a new stand at Plainmoor in 2012 and have agreed to share their ground with National League South side Truro City next season while the Cornish club builds a new stadium. The Gulls are currently second-from-bottom of the National League, having been relegated from the Football League two seasons ago. The club had to make drastic cuts after lottery-winning former owner Thea Bristow left the club last summer, with a new board taking over the club and being forced to close the academy and slash the playing budget. The planned site for the new stadium would be a 42-acre piece of land in the Barton area of Torquay which has already been earmarked for sport. It is unlikely that Plainmoor would be redeveloped for housing as the land it occupies is deemed to be a community asset for sport. "We could be moving within 18 months or two years, the developers feel the building of the stadium would take no more than six months," added Phillips. Torquay manager Kevin Nicholson has spent the best part of the last decade with the Gulls as both a player and coach. "It would be a massive step forward for the club," he told BBC Sport. "Having your own new stadium, you only have to look at Shrewsbury Town, where they dropped to and where they are now and how their new stadium has played a part in that. "I think the potential there is huge, it really would be a massive thing for the football club's long-term future."